The elements' most renowned appearance in literature is in chemist and Holocaust survivor Primo Levi's The Periodic Table (1975). Each chapter used an element relevant to his life at the time as a theme. (This partly inspired me to link each chapter of my 1999 book, Genome, to a human chromosome.) But the periodic table itself is ideal material for "novelisation," because each element has its own personality, both physical and cultural. It is a cast of vivid characters already. Meet the metals: precious gold, monetary silver, indispensable iron, conducting copper, heavy lead, light aluminium, utilitarian tin, liquid mercury and tough tungsten. Meet the colourful ones: black carbon, white calcium, orange sodium, blue cobalt, bright neon, shiny chromium, green arsenic. Meet the life-ingredients: vital oxygen, fiery phosphorus, light-footed potassium, villainous chlorine, neutral nitrogen and hellish sulphur. 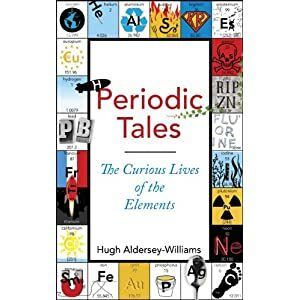 Meet the exotics: priceless palladium, massive uranium, terrifying plutonium, novelty niobium, foodie-fashionable selenium, strange vanadium (inexplicably a favourite of marine creatures called tunicates). Meet the nonentities: boron, zinc, nickel, argon and antimony. The elements tell the story of human specialisation; and specialisation explains prosperity. When people have to be self-sufficient they have to be generalists, as good at foraging as they are at entertaining themselves-so your food and entertainment are only as good as you can make them. But when people began to exchange things they were good at for those others were good at, the result was a higher standard of living for all. So I get the Coen brothers to make movies for me, Delia Smith to try recipes for me, Steve Jobs to design my electronic products and the local supermarket to source my food-all in exchange for the one or two things I produce. The more we specialise as producers, the more richly we diversify as consumers. The discovery of the elements shadows and to some extent explains this evolving history of specialisation. The ancients knew of just seven metals: gold, silver, copper, tin, iron, lead and mercury. By giving each specialised roles, they improved their living standards-tin for hardening bronze, lead for moulding, silver for coinage and so on. By the modern era only one more metal-zinc-had joined them (although platinum was known to natives of the Americas). But then came a steady flow of new metals, each of which finds its particular role in technology and society: tungsten for hardness, aluminium for lightness, chrome for polish, neodymium for magnets, barium for medicine. Each finds its niche as surely as each profession and vocation does in human society. Just as our story is one of specialisation, so the story of chemistry is one of purification. Each metal marches into our lives along a path from novel to banal, says Aldersey-Williams. Aluminium was once so difficult to make that Napoleon III used aluminium cutlery for only his most favoured guests and gave his son, the Prince Imperial, an aluminium rattle. Then it became so cheap that it was considered, well, cheap. Titanium, once rare and exotic, is becoming ubiquitous. For niobium and tantalum, Aldersey-Williams writes, "the journey is just beginning." This is a tantalising thought. There are so many elements whose talents we have barely begun to use.